They can heal you; or so they claim. Fr. Ralph DiOrio, Fr. Francis Macnutt, "Fr" Richard McAlear, and "Fr" Fernando Suarez are just a few past or present members of the Vatican II sect clergy claiming to be able to heal people. Their services are always packed, unlike the typical Novus Bogus "mass" where the Church is near empty. As Christ said, "Unless you see signs and wonders, you believe not." (See St. John 4:48). God can and does heal people. Miracles can and do happen. However, one must discern what really comes from God, and what does not. Unfortunately, many people get trapped into staying in the Vatican II sect for this very reason. People will say that it must be the True Catholic Church because God would not permit such signs and wonders otherwise. This post will examine some well-known "healers," some arguments to help those who believe in them to see the truth, and give some signs of false healing miracles. 3. Fr. Ralph DiOrio was ordained in 1957. He claims that "On Sunday, May 9th, 1976 (Mother’s Day), Father Ralph Anthony DiOrio, Jr. was openly blessed with the Holistic Charisma of Healings." (whatever that means). He claims that he knew he had the "gift of healing" his whole life. He is quoted in People magazine as saying, "Whether church officials of any denomination accept us or not, we’re here to stay. That’s God’s plan, not mine." His "healing ceremonies" resemble a Protestant revival. He retired January 2017. 4. Fr. Francis MacNutt was ordained in 1956. He became involved in the Catholic (sic) Charismatic Movement during the late 1960s. In 1980, he broke his vows to "marry" a woman more than 20 years his junior and set up a "healing ministry." In 1993, the Vatican II sect granted him a "dispensation" from his vows and "Bishop" John Snyder performed their Church wedding in Florida. In 2007, the Modernist Vatican co-sponsored an international conference with his "Christian Healing Ministries" for 450 Catholic (sic) leaders from 42 countries. Now, turning 92, he turned the organization over to his concubine. In the placebo effect, faith in simple sugar pills stimulates the mind to control pain and even heal some disorders. In certain experiments, among those with terminal cancer, morphine was an effective pain killer in two-thirds of patients, but placebos were equally effective in half of those! The placebo tricks the mind into believing relief has come, and the body responds accordingly. Through biofeedback, people can train themselves to direct bodily processes that previously were thought involuntary. They can control blood pressure, heart rate, brain waves, and even vary the temperature in their hands by as much as 14 degrees. Under hypnosis, 20 percent of patients can be induced to lose consciousness of pain so completely that they can undergo surgery without anesthetics. Some patients have even cured warts under hypnosis. The hypnotist suggests the idea, and the body performs a remarkable feat of skin renovation and construction, involving the cooperation of thousands of cells in a mental-directed process otherwise unobtainable. Most of these "healing services or masses" are conducted like Protestant revivals, where the emotions of those present are worked up to the point of making them susceptible to induce certain cures. Point to be made: tell those involved with these "healing masses" that mental suggestion, charlatans who place false people in the audience to be "healed," and demonic activity to dupe people, can all be possible causes of "miraculous cures." What Does The Church Teach Concerning Miracles? Are performed for the glory of God and the good of humanity, and are the primary or supreme ends of every miracle. Benefits either spiritual or temporal. The temporal favors are always subordinate to spiritual ends, for they are a reward or a pledge of virtue, e.g. the widow of Sarephta (1 Kings 17), the Three Children in the fiery furnace (Daniel 3), the preservation of Daniel (Daniel 5), the deliverance of St. Peter from prison (Acts 12), of St. Paul from shipwreck (Acts 27). Thus semeion, i.e., "sign", completes the meaning of dynamis, i.e., "[Divine] power". It reveals the miracle as an act of God's supernatural Providence over men. It gives a positive content to teras, i.e., "wonder", for, whereas the wonder shows the miracle as a deviation from the ordinary course of nature, the sign gives the purpose of the deviation. Ask anyone who is caught up in these "healing masses": To what doctrine of faith and/or morals do they attest? That false sects are a "means of salvation"? That "there is no Catholic God"? Do any of the aforementioned healers seem especially holy? What benefits are given? "Emotions and a feeling of deep peace"? Some Warning Signs Against False "Miraculous Healings"
1. The "Healer" claims "you must have faith" and "If you don't believe strongly enough, God can't heal you." God is in control of the universe and faith is not some condition without which He cannot act. God can cure whomever He wishes, in His Divine Providence. Someone without faith may be cured because of others praying for them, or because of a greater spiritual good that will result for the one healed, or perhaps another. Of the twenty-five (25) miracles Christ performed as recorded in the Bible, fifteen (15) were done with no faith on the part of the recipient (e.g., the healing of the ear of Malchus in St. Luke 22: 49-51). On the other hand, psychological healings (power of suggestion) does require belief--not in the true faith, but in the "healer" or even a placebo. 2. The "Healer" needs to touch you or have you place your hands on some object (blessed or not). God does not need anyone to touch anything to heal. Consider how Christ brought Lazarus back from the dead without touching him, and He healed the centurion's servant from afar. Making contact with people (or objects--"put your hands on the TV and be healed" as those phony Protestant "televangelists" would declare back in the 1970s and 80s) is part of a psychological build up. 3. The "Healer" claims the cure is gradual. Miraculous cures are instantaneous and permanent. People who claim they "begin to feel better" and then go to doctors to complete the "miracle" shows a true case of psychological healing, not Divine Intervention. Don't let yourself or others get taken in by "healing masses" and "healing services" of Vatican II sect clergy. They are false miracles (many psychological cures) in the context of a false religion and a false "mass" (Novus Bogus). God will not ratify a false sects' teachings with His Power. Pray to the Divine Physician to be healed, but also remember His warning, recorded in St. Matthew 24:24, "For there shall arise false Christs and false prophets, and shall show great signs and wonders, insomuch as to deceive (if possible) even the elect." (Emphasis mine). If the charismatics were all that they presumptuously believe to be, there would be no Crisis in the Church. We would live what John Paul II, the Great Apostate, said: the Spring of the Church. But since this movement is made up of fools and prouds imitators of Protestants and Montanists, then it is but a ridiculous show of horrors. He was allegedly electrocuted and saved by God and then became a miracle worker. Do you know of this man? I don't believe in him but I know several people who do. His story sounds like the pilot for a science-fiction TV series! God had him "struck by lightning" so to speak, in order to "heal people." He is a member of the Vatican II sect and has been approved by the V2 sect Archdiocese of Boston. He's as genuine as a 3 dollar bill! Excellent article exposing these charlatans!! A relative of mine went to a healing service a few years ago held by Fr. Ralph DiOrio. She claimed she was healed from Ulcerative Colitis and would urge everyone to go to his healing services. A few months ago she ended up in the ER with a case of Ulcerative Colitis so bad she had peritonitis and was hospitalized, put on a feeding tube and administered IV antibiotics for over a week. I believe when God heals, he heals for good, that there are no relapses as my relative had. A few yrs ago she was urging me to go to Fr. Ralph DiOrio's service (this was before I found the true Roman Catholic Church). I am so grateful I did not attend one of those services! Many people get taken in Joann. Sad. By God's grace you weren't fooled! Introibo - Part of the reason I wasn't fooled" by these charlatans is because when I was just a small kid my mother was diagnosed with Multiple Sclerosis. She was raised Irish Catholic and her Protestant cousin got her listening to Billy Graham on the TV (1950's). Then her Protestant cousin took her to Oral Roberts services. She ended up leaving the Roman Catholic Church and religiously following Oral Roberts like he was some kind of a God. She would say that she didn't receive her healing from him "because of her lack of faith". Every Sunday she would have him on the TV. She would send him money each month, and bought his Bibles, magazines, prayer cloths etc. By the time Billy Graham and Oral Roberts had done their brainwashing job on her she turned totally away from the Catholic Faith. I still cry over what had happened to my Mother. My Father was a non-practicing Catholic. I was 21 yrs old when she died at the age of 52 yrs. (Needless to say, but watching my Mother suffer and putting her faith in these Charlatans had an impact on my view of religion plus hearing the Catholic Faith constantly being bashed at home on a daily basis didn't help either, as it led to confusion). How I found my way home at the age of 62 yrs to the True Roman Catholic Church after all of that mess only God knows! That's some incredible journey you went through. Thanks for sharing. God obviously had plans for you, and you followed His prompting! I was raised Novus Ordo and I too was ALMOST taken in by Protestants.With no education of True Catholicism,its easy to be led astray by Protestants.Eventually I stopped caring about the Novus Ordo and lived like an atheist for a good 7 years,at least! It wasn't until 2011 that I discovered the true Catholic Faith. Deo Gratias Laus Tibi Christie!!! Anonymous - Your story was so good to hear!! Welcome Home!! Deo gratis my friend! You have come home to the One True Church of Christ by the grace of God! You'll be in my prayers that your faith may continue to grow! That is a remarkable story! This is truly a miracle. No problem Joann. Send me your email address. I will not publish it. Then I will send you an email that preserves my anonymity. It will have "Hello from Introibo" in the Subject line. 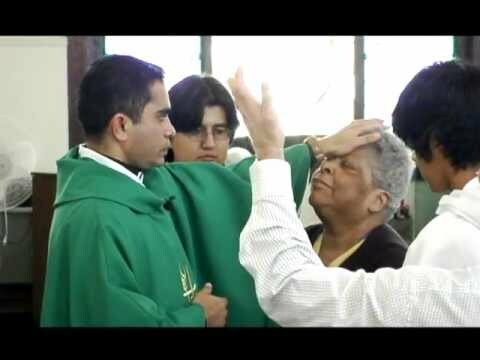 I went to a "healing Mass" once with my mother when I was having problems and I was still in the Novus Ordo. It was too wacky for me and I left after a few minutes though I forget the details because it was so long ago. I wonder how powerful the mind is in causing what seem to be miracles in people and I wonder how powerful the demons are in causing what seem like miracles as well. I myself witnessed a remarkable sign or wonder at a traditional Latin Mass when I was new to tradition. Was it really a miracle? Or was it a hallucination caused by my own mind because of my belief? I believe the sign was from God, but who knows, it might have been a false miracle and the product of an active imagination. I've noticed in 2017 A.D. a great many of Roman Catholic people are obssessed with Fatima and Our Lady of Good Success. More priests and bishops need to teach their chapels that private revelation is not required belief and not to base their faith & eternal salvation on these apparitions. Anonymous - I too have noticed so many people obsessed with Fatima especially. I have often wondered why the obsession? With some people if you don't share their obsession they get upset like there is something wrong with you. Recently a SSPX type flipped out because they thought Fatima was beyond private revelation because so many people witnessed the miracle. I calmly explained that even if 5 billion ppl saw the miracle,its still private revelation because,anything after the death of St.John on the island of Patmos is not required belief. I wasn't being sarcastic and actually felt bad that no one had explained this to them before. I've written several times that private revelations (even those approved by the Church) are not necessary for salvation and are not required to be believed. I refuse to get caught up in "the real message of Fatima" and what Our Lady allegedly said. Learn the teachings of the ore-Vatican II theologians and know the Faith!! Be careful what you believe that seems miraculous. Always report it to a Traditionalist priest you trust. It happened years ago. There was no prophecy or message or anything and I was not told any secrets. The main thing that happened was a vision that I saw at Mass which I believe only I saw. At the elevation of the host I was looking at the host and the host started to glow like the sun and it continued to glow for a few seconds until the priest lowered the host. It was very frightening and nothing else like it has ever happened to me in my life. I am not some kind of saint who receives visions all the time. Now that you mention it, I will tell my priest about it on Sunday and see what he thinks about it. A few months ago I was kneeling at the Communion rail waiting to receive when I heard an internal voice say to me "Lo I am with you always, even to the end of the earth". I was startled and couldn't figure out where this voice inside my head was coming from. I later learned that it was a verse in the Bible, and why it came to me at that particular time when kneeling at the altar rail, I do not know. It must have been a verse I had heard before and it just happened to come into my memory at that particular time at the altar rail. This is the first I have shared this with anyone lest I be accused of losing my marbles!! Encounters with God can and do happen! Just confide in a Traditionalist priest you trust for guidance. Introibo. - I just read that in the 1950's Cardinal Richard Cushing was urging Catholics to attend Billy Graham crusades. Have you heard of this? To clarify: During the 1960s NOT the 1950s! Introibo - Thanks for the clarification. So many souls were led astray from the Faith with the Billy Graham crusades as was my own Mother. It is so disheartening. To find out that a Cardinal was actually urging people to attend these crusades is diabolical. An apostate cardinal. The result of the Vatican II sect's formation where thousands of clergy fell from the Faith and started a false religion posing as "Catholicism." Wasn't Apostate Cardinal Cushing urging people to go to Billy Graham Crusades before Vatican II was instituted? Not to my knowledge. He might have done so privately but not publicly. If anyone has a citation to a reliable source stating otherwise, I'll be happy to publish it. The reference that I found regarding Cardinal Cushing and the Billy Graham Crusades of the 1950's was in google books entitled "The Christian College and the Meaning of Academic Freedom" by William C. Ringenberg at page 124. (I don't know how to make a link to the source). I don't know what to make of it out of context. If it was 1955 or later, Pope Pius XII was sick with stomach cancer, and maybe that's why he wasn't excommunicated. If it was in the context of "academic freedom" Cushing could have used that as a pretense for his pushing the Modernist agenda, until the floodgates of V2 were opened. Now, tell if this isn't a "miracle". I just a short while ago explained to the young man aspiring to be a priest why protestant and Novus Ordo "miracles" are lies, and here you post this wonderful article! Who says miracles dont happen. FR. Nkamuke Okechukwu Bede. Thank you for the great story Father! I'm always glad when God uses me as His unworthy instrument to make a point! Introibo - What are you thoughts on such healing practices as reflexology and acupuncture? I have back problems and have been referred to an acupuncturist. I refused to go as it has its origin in the Taoist religion. Although some may be medicinal, a lot of it is usually based on pagan teaching. Its success rate is dubious. Just my two-cents. My oh my how we need a few men like him today instead of these demonic imposters calling themselves priests. His voice was clear,stable,consistent,i.e. a voice from a different generation that doesn't exist anymore. Made me slightly sad but Jesus Christ is with us in the true catholic chapels scattered throughout the World. We are so blessed to still have the Holy Sacrifice of the Mass celebrated by valid Catholic clergy after all the sin we have committed. More true words were never written my friend. Call me crazy but I love listening to Bishop Bawden videos on YouTube. He'd be the first to admit he doesn't have the credentials of Fr.DePauw but their preaching style is similar. Both of them,while acknowledging Fr.Depauw's impressive credentials to Bishop Bawden's country priest ethic,seem like genuine men who love the Catholic faith. Simultaneously both seem like humble common sense type men who'd sit and have a drink with the regular working families. I'm glad you don't call him "pope." I agree that we need to try and come together to solve the crisis. However, I doubt his orders. The "bishop," Bob Biarnesen has an unknown lineage and unknown Ecclesiastical training. Bawden never mentions him. Why isn't he his "cardinal." The whole thing smells fishy to me. You should email him and ask those questions. He is on the right path as time has proven traditional orders are stagnating and unity seems impossible at this point. We Catholics need to try something different. May you all be reminded that there is one true God who surpasses your limited understanding and is pleased with those who truly serve Him in Spirit and in truth. Ask yourself who do I put my trust in , my true Catholic Church and it’s “approved” members? Or do I put my trust in the Almighty living and true God ?? ?On your death bed will you call out to the right people in the church or to the creator and redeemer of your soul?